While we will fondly remember all of the good times GSP and our travelers shared with The Wall, we know that with its recent demolition came great progress towards the completion of WINGSPAN. When WINGSPAN began in July 2012, a gallery of photo renderings and a walkthrough video was created. Scroll through the galleries and photos of The Wall. Let us know how you think the updates compare to the updates by commenting below! And never forget, our good friend The Wall. Construction Update: The Wall Is Gone! As updates on the airport continue, we’ve been making major progress towards completion! 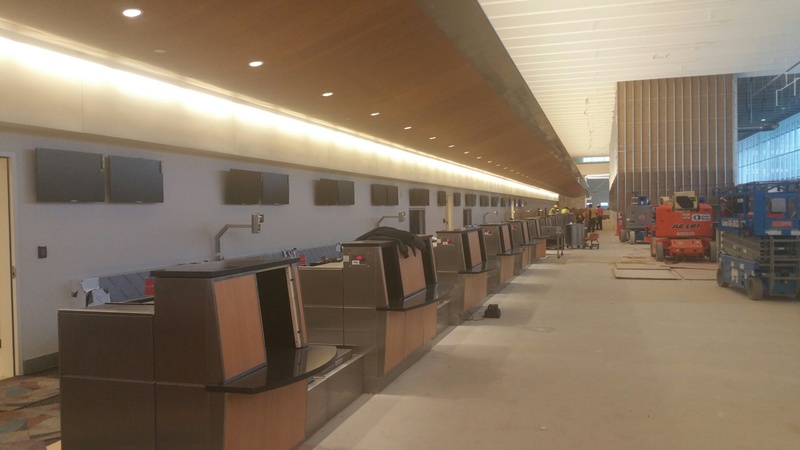 We are thrilled as we are finishing the Allegiant, Delta and Southwest ticket counters. 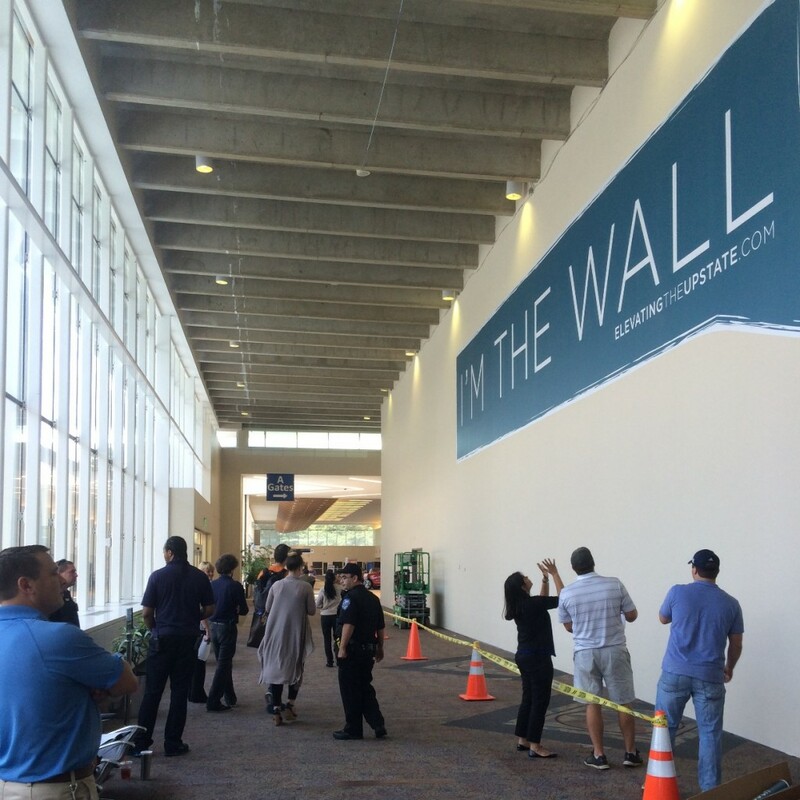 While we will miss our beloved Wall, travelers and meters-and-greeters can now get a firsthand look at the work happening on the first floor. We look forward to seeing you soon, Travelers! Hello travelers! Sorry I haven’t updated you in a while, but GSP has been making progress on a lot of projects to make this place even better. There has been a lot of work in the airline ticketing lobby and airline ticket offices! 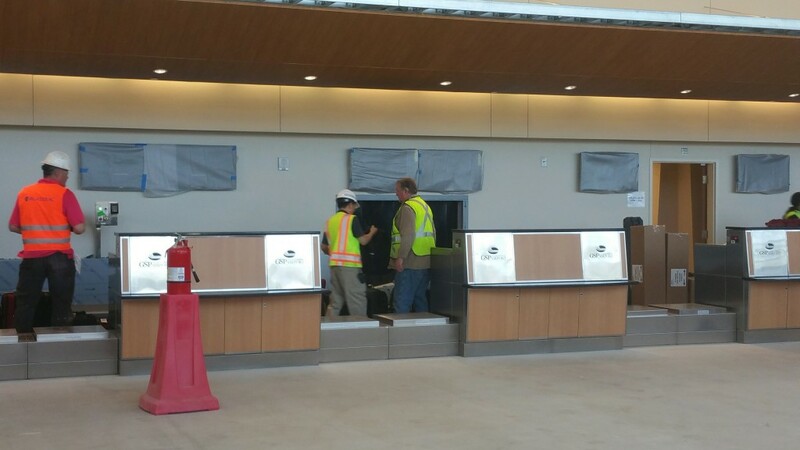 The guys in the hard hats have been working to complete the ticket counter installation and the quartz counter tops. 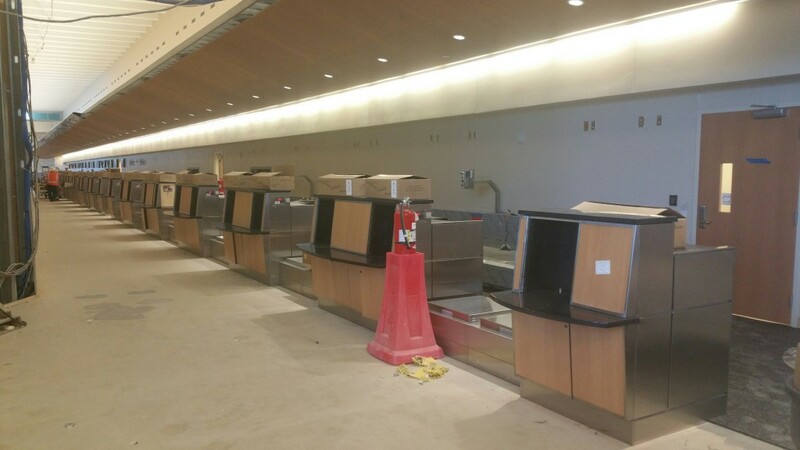 Behind the ticket counters, the new flooring is being installed and the digital monitors are being hung. 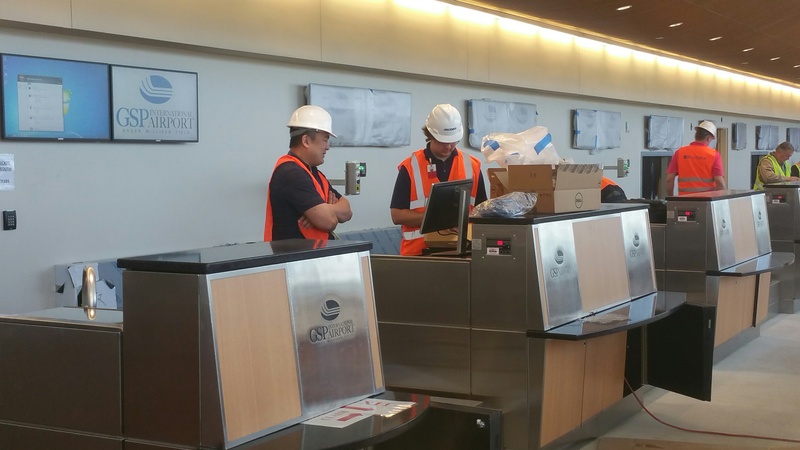 They are also working on finishing an overhead “cloud” feature above ticket counters. They have installed a number of gadgets as well, including IT, telecom, and CCTV. Their teams have been hard at work testing all this new airport technology, like the TSA baggage screening equipment. After Allegiant, Delta and Southwest Airlines are relocated to their new ticket space within the next few weeks, their current ticket counter space and the wall behind it will be torn down. This demolition will make way for the construction of the remaining airline ticket counters and offices. While this is very exciting news, it is a little bittersweet for me. This will be my final post as all the cool new ticket counters are unveiled. I have loved sharing the latest happenings from inside the terminal and I hope you enjoy the changes as much as I do! That’s all the updates I have for now, folks. 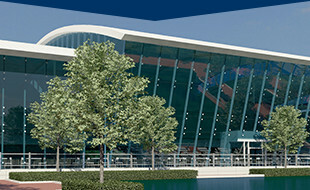 Stay tuned for Flyer Fact Friday and keep an eye out for more airport updates from my friend The Terminal! Good afternoon, my most favorite travelers! I hope that you were able to thoroughly enjoy the holiday season with your friends, family and loved ones—I know I sure did. And now, I’m making plans to ring in the New Year at my favorite place: the Greenville-Spartanburg International Airport. When it comes to New Year’s celebrations, the Navy Pier is the epicenter of all things spectacular. Enjoy entertainment, rides and attractions at this family friendly destination, and at midnight, watch a kaleidoscope of colorful fireworks—perfectly synchronized to music over Lake Michigan. Calling all Clemson fans! As the Tigers prepare for the big playoff game, you can book your direct flight to watch them take on Oklahoma at the Capital One Orange Bowl. American Airlines in offering direct service to Miami International to help get fans into the action. Nothing is more iconic New Years than watching the Ball Drop with thousands of your closest friends! Head to New York and reserve your spot at one of the hundreds of parties happening in Times Square and beyond. We also have direct flights to Dallas, Orlando, Houston, Newark, Philadelphia, Tampa and Washington, DC. No matter where you decide to venture for New Years, we hope that you enjoy safe travels and are able to start the New Year off with a bang! Can you believe the holidays are finally upon us?? It has been quite busy around here, with people coming and going to visit family and friends for the holiday season. Luckily, the renovations happening haven’t slowed anyone down. This is especially true during the holiday season. The airport is doing everything possible to prepare for the busiest time of the year. In fact, there’s even going to be overflow parking areas to help accommodate the influx of passengers in the coming weeks. So not to worry, travelers. All of us here at GSP are ready to welcome you with open arms—and plenty of holiday cheer to spare! That’s all I have for today, folks. The Tigers are taking flight! Did you hear that the Clemson Tigers are heading to the Capital One Orange Bowl this year?? Pretty exciting stuff! Not only that, but American Airlines is offering direct service for to Miami International Airport to help get fans into the action. The flight will depart from GSP at 12:10pm on December 30th and will arrive in MIA at 2:10pm. The returning flight from MIA is on January 1st at 2:00pm and will arrive back at GSP at 4:00pm. American Airlines currently operates several daily nonstop flights from GSP including Charlotte, Dallas, Philadelphia and Washington, D.C. If you’re a Clemson fan, I’d definitely suggest booking your flight at americanairlines.com soon. Word around here is that the flight will fill up fast! Construction Update: We’re making progress! Many apologies for my absence as of late. There is just so much going on at the airport right now and with the holiday traffic I just had to enjoy the obligatory people watching that comes with it (spoiler alert: it was magnificent!). 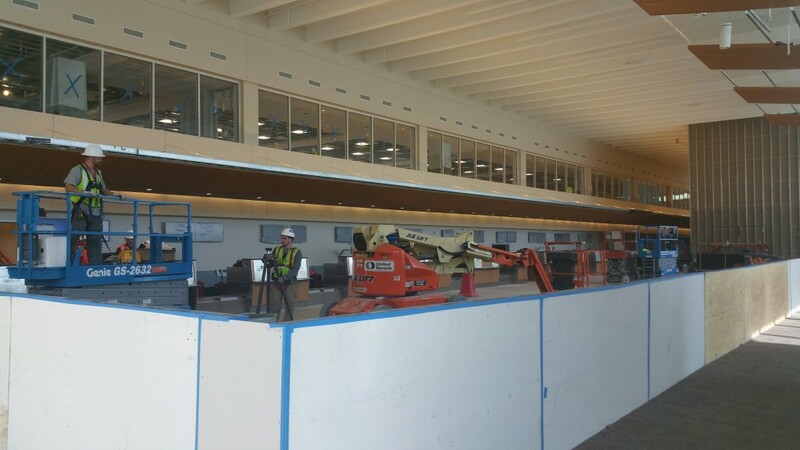 This week, our incredible construction team will start on the renovations in Concourse B, which includes the installation of sprinklers and electrical systems, the painting for the window frames and ceiling, and the placing of tile flooring. Once the tile work is complete, carpeting will be placed in the airline gate and holding areas. The carpet installation will happen in small sections, so only a small area will be blocked off at a time during the installation. Not all gate holding areas will be closed at one time, so you will still be able to access your desired gate—just keep an eye out for signs showing you where to go. Thank you all for your patience and cooperation with our team as we work to make our beloved airport even better than before. Until next time, safe travels you wonderful humans! You will never believe the news I heard around the airport over the weekend. It turns out that US Airways completed its final flight before officially merging with American Airlines—giving it the largest fleet in the world, with more than 900 mainline aircraft. The final flight under the US Airways name was Flight 1939, which was named in honor of the year US Airways started flying. The flight left San Francisco Friday evening and touched down in Philadelphia Saturday morning. Seated on this historical flight were past US Airways employees and frequent flyers. The flight attendants passed out champagne and reminisced until the passengers drifted off to sleep. Upon Flight 1939’s arrival, passengers were greeted by crowds of people showing their respect for the 76-year-old airline. We have loved doing business with US Airways and look forward to continuing to work with American Airlines. Far thee well, my travelers! I am back, travelers! Did you miss me? I certainly missed all of you. I have exciting news to share with you today. It is my distinguished honor to announce that our fearless leader, David Edwards, is the cover story for this month’s Airport Revenue News (ARN). David Edwards, GSP’s president and CEO, was recently named Director of the Year, Small Airports Division by ARN. In this month’s issue, he shares his journey from aspiring to become a commercial airline pilot to eventually accepting a position as director for the Asheville Regional (AVL) airport—which then led him to GSP. Since he’s been at GSP he has helped lead many great initiatives, including our WINGSPAN Project. It is because of efforts such as this that he has been recognized with such an incredible award. Truth be told, David Edwards is actually the reason why I am here! He gave me my big break at the airport as the keeper of GSP’s WINGSPAN Project. If it wasn’t for him, I would probably just be a lonely wall somewhere, and would have never had the chance to meet all of you fine people. Congratulations, David! It is an honor to work beside you and to see the incredible work you continue to do for our airport. Take care, my most favorite travelers!